As our voyage begins, we pilot through the calm, gunmetal grey waters and sloping glaciers of Beagle Channel. Turning southward, our journey begins in earnest, and we enter Drake Passage. A body of water that marks the intersection of the cold Antarctic with the warmer Atlantic and Pacific Oceans, Drake Passage is known for rollicking conditions and strong westerly winds, called the Roaring Fifties. While this passage may be challenging, you can rest confidently aboard our expedition vessel, Ocean Atlantic, which is purpose-built with stabilizers, powerful engines and a highly qualified crew. The most spirited sailors consider Drake Passage a lifetime achievement, and you will complete the crossing twice! Over the next two days, we will explore to the sub-Antarctic islands of the South Shetland chain. Projected landfalls include: Elephant Island, home to elephant seals, sheer cliffs rising from the sea and snow-covered peaks; King George Island; Deception Island, an extinct volcano with waters warm enough for a polar swim; and Half Moon Island with nesting Wilson's storm petrels and chinstrap penguins. The itinerary and activities over the next few days depend on weather and ice conditions. The route and shore landings will be determined by the captain and expedition leader and communicated to guests through regularly scheduled briefings. As the white shimmer of Antarctica looms on our horizon, the presence of wildlife multiples by tens of thousands with many species of lively penguins, inquisitive seals, nesting birds and the spray of marine mammals. Wildlife abounds on the Antarctic Peninsula: leopard, fur and Weddell seals of Cuverville Island; humpback whales of Gerlache Strait; Paradise Bay; the dramatic Lemaire Channel's orcas. Explore as far south as possible to Pleneau and Petermann Islands, Crystal Sound and Fish Island. Visit research stations and the Antarctic Circle, if ice conditions allow. The itinerary and activities over the next few days depend on weather and ice conditions. The route and shore landings will be determined by the captain and expedition leader and communicated to guests through regularly scheduled briefings. 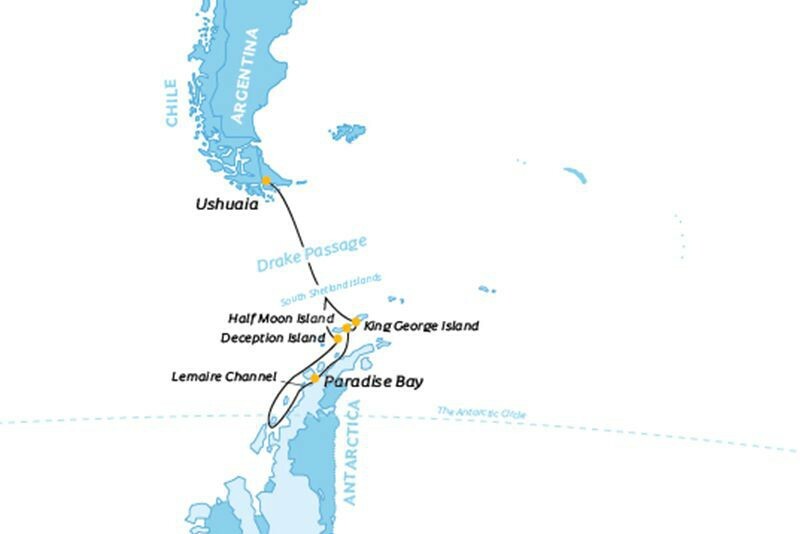 Today, we depart Antarctica and spend two days at sea on our way back to the calms of Beagle Channel and Ushuaia, Argentina. En-route, we will cross Drake Passage and cruise past Cape Horn, a legendary maritime landmark and the southern tip of South America. During our time at sea, a variety of activities will be arranged on board and it provides the perfect opportunity to socialise with fellow travellers.